If you’re buying a new refrigerator, the wealth of choices available today can be both a blessing and a curse. New technology in home appliances has created a seemingly infinite variety of selections. The model that’s best for you will depend on your budget, available space and the features that are most important to you and your family. Whether you are planning a kitchen remodel or it’s simply time for a new fridge, read on for some professional advice on choosing a new refrigerator. Start with determining your budget. Many consumers make the mistake of putting the proverbial cart before the horse, falling in love with appliances that are not feasible. Determine how much you will spend and measure the space available in your kitchen. Will your space allow for a side-by-side model, which requires extra space on either side for door swing? Is a pull-out bottom freezer more suited to your needs or do you prefer a top freezer, which doesn’t require bending over? Is your kitchen equipped with a water line that will allow for an ice maker or ice and water through the door? Are produce and fresh-food drawers more important, or do you mostly use shelf space? Once you have a general direction based on your needs, space and budget, make three lists. Identify those features your new fridge must have, those options you would really like and what your refrigerator choice would be in a perfect world. Do an online search for those models that fall within your budget and space allotment, then start reviewing available features. Don’t be afraid of off-brand models, as long as they are new (not refurbished) and come with a full warranty. Manufacturers often sell the same products to name-brand and off-brand distributors. Read consumer product reviews to identify strengths and weaknesses of different models, but keep in mind that many reviews are “planted” by competitors or the retail outlet itself. Identify your top two or three favorite models, then move to the purchasing stage. Once you identify the models you prefer, compare prices and logistics. If you purchase locally, will the retailer deliver to you for free? Will they set it up and remove your old model? Will you need to pick up the appliance or have it shipped? A cost-effective insider secret is to select your favorite model with the most inexpensive drop-ship option or drop-delivery option, then contact a local appliance repair service for installation and set-up. 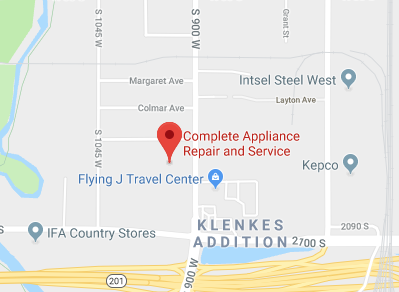 Complete Appliance Repair in Salt Lake City specializes in helping our customers select, purchase and install new kitchen appliances. Their professional technicians can handle all the heavy lifting and hassle associated with replacing your refrigerator or any appliance. If you’re buying a new refrigerator, let Complete Appliance Repair make the process simple and worry-free. This entry was posted in Blog and tagged Refrigerator maintenance, Refrigerator tips on January 20, 2015 by admin. Summertime means cold beverages and weekend barbecues, but if your refrigerator goes on the fritz, you could find yourself in a bind. Before you panic about your picnic, it may be helpful to understand how to troubleshoot refrigerator issues. Refrigerator repairs can be complicated, so if you can identify your specific refrigerator problems, it may help avoid spoiled food and fun. First, check to see if the unit is plugged in. Pets, vibration, or items falling off the fridge can cause it to become unplugged. Next, check the breaker or fuse box. Make sure your fridge shut-off switch (if it is so equipped) has not accidentally been bumped into the off position. Check the temperature setting. Finally, try plugging something else into the outlet and try plugging the refrigerator into a different outlet. If none of these fixes the problem, it’s time to contact a refrigerator repair professional. Check the temperature setting to be sure it’s correct. Pull the fridge out from the wall, unplug it, and allow it to sit undisturbed for an hour or two. If it works after you plug it back in, your fan or compressor may be overheating. Clean the condenser coils with a vacuum (on the back or underneath), as this may fix the problem. If not, the problem may be the thermostat, fan, defrost system, or a relay. All of these will require the attention of a professional appliance repair service. First, check the temperature control setting. Verify that the fridge has ample room for air circulation around and above the unit. Three inches is the ideal amount of space required for proper air flow above your refrigerator. Check vents and condenser coils for debris and lint. If you have pets, hair can quickly build up. Check the insulating strip around the door for damage, and make sure the door is fully closing and sealing. If none of these seem to be the problem, you may have a leak in the refrigerant line, a bad fan, or a faulty defrost system. Time to call your friendly refrigerator repair company. You can avoid having problems like these by following some common sense maintenance practices, like keeping your condenser coils clean and routinely vacuuming around and under the fridge. It is also helpful to have an annual professional maintenance service. The repair technician can test critical components to ensure they are operating within the specifications for your refrigerator, check Freon levels, and take care of anything that may need attention. This way, you won’t have to worry about missing out on any summer fun, or losing your food to spoilage. This entry was posted in Blog and tagged Refrigerator maintenance, Refrigerator Repair, Refrigerator tips on July 9, 2014 by admin.